What better way for retailers to celebrate the low-cost Amazon Kindle Fire than to offer cut-rate prices on existing tablets. 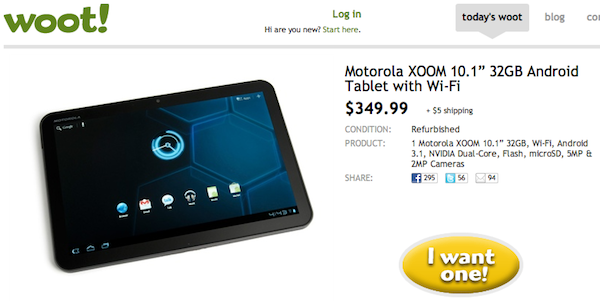 Woot has a one-day special on Motorola XOOM WiFi, refurbished, for $349.99 plus $5 shipping; the tablet typically retails for $499.99. Meanwhile, Best Buy has dropped the price on BlackBerry PlayBook again to $299.99 -- that's $200 off the list price -- for the 16GB model. The deals come one day after Amazon announced its 7-inch tablet, for $199. The online retailer is taking preorders now, but Kindle Fire doesn't ship until November 15. Best Buy and Woot deals may or may not be coincidentally timed, but they foreshadow what likely will be a price war during the holidays. Tablet prices are going south for the holidays. Already, Best Buy offers more than 50 tablet SKUs, the majority from top-tier manufacturers, like Apple, Motorola, Samsung and Sony. "There is no way there is room on the shelves of America’s retailers for that many tablets", Stephen Baker, NPD's vice president of industry analysis, said earlier this year. "The fight for shelf space is therefore likely to be vicious as we head into...the holiday season -- and robust shelf space competition inevitably leads to one thing: Price Wars". Retailers typically use a number of tried-and-true techniques to drive interest in different product categories, with short-term discounts, rebates and even gift cards among them. With tablets, they will be looking for that magic price point consumers can't resist. Kindle Fire seems to have found that price already: $199. To be clear, overall tablet competition will drive the price war, not Amazon's tablet. Baker tells Betanews today: "Unless Fire really sells and really impacts other SKUs then it will not set off a price reaction. It really is not the same thing as a tablet". Back specifically to these two deals, I'll start with XOOM. It's a helluva tablet for the price -- 1GHz dual-core nVidia Tegra 2 processor; 10.1-inch display with 1280 x 800 resolution; 1GB of RAM; 32GB internal storage, expandable with MicroSD card; 5-megapixel back-facing and 2-megapixel front-facing cameras; 720p video recording; 1080p video playback; HDMI and USB 2.0 ports; accelerometer; barometer; gyroscope; Android 3.1 (Honeycomb). But it is refurbished. While I'm a big fan of refurb PCs, I'm more cautious about consumer electronics devices. The fine-print matters -- the warranty. I buy when the full warranty backs confidence in the refurb; otherwise not. Best Buy's BlackBerry PlayBook pricing is altogether different. Sales of the tablet collapsed during second quarter, dropping to 200,000 from 500,000 units sequentially. That suggests an inevitable inventory build up in channel, sitting on store shelves and in warehouses at retailers like Best Buy. "Playbook is marked down because it doesn't sell, not because of competition," Baker observes. Best Buy also cut prices on TouchBook, not long before HP killed off the product after six weeks of sales. I don't suggest that Research in Motion plans something similar. The discount merely points to Best Buy trying to churn up interest in the tablet, while clearing out inventory -- a common retail practice. Playbook is marked down because it doesn't sell, not because of competition. Today's deals foreshadow the first of potentially many price cuts as the holidays approach and retailers feel pressure to move inventory. At what price are you likely to buy a tablet? Please answer in comments below and take the poll above.